Today I shall like to talk about a publishing collaboration that I would call very successful and profitable. This makes me ponder on how important are, in the publishing world as well, human contact, a clever vision of their profession and affinity besides the merely professional and business aspects. 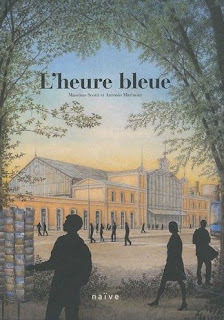 During the Salon de Montreuil (the Paris Children's Literature Show, occurred Novenber 25th to 30th), I had a big surprise: in the booth of Naïve Publishing House I found a French copy of the picture book L'Ora Blu, published by the Italian Topipittori only a few weeks before. It is not the first time that Naïve publishes, at a very short distance, one of the books from Topipittori: in fact, in 2007, they published Velluto. Storia di un ladro see here below. 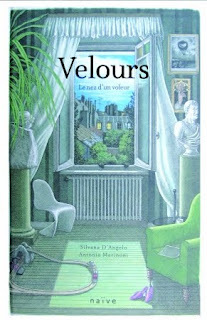 Velours : Le nez d'un voleur, texts by Silvana D'Angelo, illustrations by Antonio Marinoni, translation into French by Sophie Royère, Editions Naïve (September 1st 2007). Talking to Ms Patrice, who's in charge for Naïve Jeunesse, I was able to confute how much it can be fundamental (especially when talking about small publishing houses) the attention to the product of course, but also and mostly, I would say, the open-mindedness and the attention to those foreign publishing companies that produce books similar to their own needs, with full and open collaboration. I must confess that this conversation was, for me, source of great satisfaction as it confirmed some of my own firm beliefs as the value of sharing, but also the idea that in publishing there should be no limits for what regards collaboration amid actors of the same genre. I make a step forward by admitting that I believe openness to blending extremely important, in whatsoever way, as it inevitably brings to enrichment. To understand what I mean, just think of Bruno Munari. Starting from the 60s-70s, the publishing industry dedicated to children's literature has always been extremely advanced and open to experience, led by that common sense that pushes authors, illustrators and publishers in a direction with many facets but one, only, main purpose: the creation of little masterpieces to be delivered to children. Far from me the wish to create the illusion of a perfect little world, I cannot affirm that all publishing houses are working at high levels: very poor books, with an awfully low quality both from the graphic-illustration point of view and textual one, are published almost every day. After all, business rules in this sector as well. Though, thanks good, there are still courageous people who publish even knowing that they are leading a difficult, tortuous battle, often a non productive one but still they remain firm in their purposes despite all this. This is one of the reasons why I have decided to open, starting today, a new section of this blog that will be devoted to those publishing houses that, in my very personal opinion, are operating an an excellent way: I shall keep you posted about new publications, initiatives and other from the publishers I have selected. I shall tell the names little by little... A bit of souspence isn't bad after all! I am glad I started this section talking, at once, of two publishing houses: Naïve, of whom you shall hear soon further news, and Topipittori that I deeply esteem both for the beautiful minds that lead it, Giovanna Zoboli and Paolo Canton, and for the care and the almost crazy attention they have for the books they produce.